Everyone knows, when it comes to playing a leading role in cash and liquidity management, there’s no one better than a corporate treasurer. However, with a shift in focus towards a more strategic direction, can the treasury department of the future exert their influence at a higher level? Over the last few years, we’ve seen substantial change in the roles and responsibilities of the corporate treasurer. Treasury functions have evolved in response to regulatory changes and an unstable macroeconomic environment, even as the dark cloud of the 2008 global financial crisis hungover like a shadow. Like the true heroes they are, treasurers and treasury practitioners have responded by grasping technology to become super-efficient and ultra-productive – albeit after a little persuasion . They’ve accepted the value Treasury Management Systems (TMS) and other treasury tech provide and have become advocates for automation, digitalisation and efficient processes. You could even say they’ve mastered the art of the traditional treasury function. So, what pain points are holding treasurers back in doing the same for their strategic responsibilities. Financing – Lack of debt finance means treasurers are having to look at alternative options to raise capital. Cash Management – Real-time data and analysis requirement to ensure long term efficiency. Risk – Manage exposure to volatile FX market and fluctuating interest rates. Security – Growing use of technology significantly increases opportunities for cyber security breaches and internal fraud. Regulations – In response to the 2008 Financial Crisis, there have been regulatory attempts to strengthen governance and improve how organisations manage and report on financial health. The rate of change occurring in the treasury world is dramatically accelerating. As roles and responsibilities focus more towards a strategic outlook, corporate treasurers are turning to financial technology (FinTech) companies, who have entered the marketplace to meet the technological demands of the modern-day treasurer. At its core, CMP provides a single access point to view a corporates entire banking network. 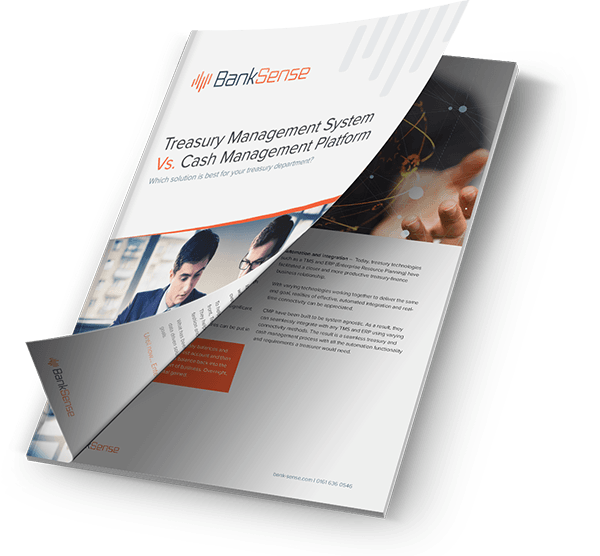 In other words, treasurers can view all their cash balances in real-time, across multiple banks and in different currencies – However, they’re more than just a cash management tool. CMP also allows treasurers to take action. A CMP will allow a treasurer to sweep cash between accounts to truly optimise the value of their cash position. This means, treasurers can invest cash overnight in high interest accounts and then return the funds back into the account for full availability, for start of the next business day. In essence, treasurers can generate additional income overnight using end-of-day balances, with just a few clicks of a button. What does this mean for treasurers? In summary, thanks to the advancement of CMP it has never been easier for treasurers to have a real-time multi-bank view of all their cash balances, and to use that overarching view to better finance their business. With this new insight, treasurers can meet board level strategic demands, and at the same time add business value to their organisation by generating additional income through sweeping. Which solution is best for your treasury department?